Designer Skin Treasured Calcium to help promote the production of melanin. 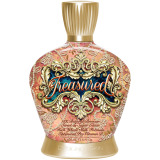 Advanced 18x Bronzing Blend features DHA. Calcium to help promote the production of melanin for richer color.